Clements Ferry Road. Codner’s Ferry neighborhood. Familiar names to the Daniel Island community. Perhaps less known are the Dover-Calais Ferry and the Scott’s Ferry. These names are steeped in the 542 years of history of Daniel Island, a history that begins as early as 1673. The need to have usable roads, ferries and bridges was essential to the early Carolina Colony. Soldiers had to move as quickly as possible in the defense of Charles Town and the growing number of plantations being settled along the Ashley, Cooper and Wando Rivers. Just as importantly these new plantations required a safe and predictable way to move their goods to Charles Town and to obtain the materials they needed to support and expand plantation operations. Sir Nathaniel’s plantation other plantation near Awendaw. Initially the ferries were propelled by long swept oars. Travel was limited to the time around the flood or ebb tides, dependent upon which direction of travel was desired. Later, larger mule driven barges were used. Mules walked in a circle turning the capstan that then drove a propeller. They would not overcome the stronger currents of the tide, but did enable earlier departure or later arrival times. A 1784 plat covering 988 acres on the southern part of Daniel Island shows the “Public Road to Scott’s Ferry.” Originally called Codner’s Ferry it operated from Daniel Island to a landing on the west side of the Cooper River at the Neck of Charles Town. This landing would be the terminus for the Codner’s/Scott’s Ferry and later the all ferries that departed from what became known as Clements Ferry. In 1680 Joseph Codner had obtained 246 acres on the northwest side of Daniel Island. It was from here that a ferry service was established. Early ferries of the Carolina Colony were chartered by an Act of the government. It was not until after the establishment of the Royal Carolina Colony in 1727 that ferries became formally regulated. The rates of passage were established and requirements placed on the owners to ensure reasonable ferry schedules were maintained. The Codner’s Ferry was so chartered in August 1731. The Codner family would own this land until 1746 when it was sold to John Scott (I). The ferry name remained Codner’s until 1765 when his grandson, John Scott (II), re-chartered the ferry in his name. Financial difficulties forced John Scott to sell the 246 acres in 1777. Joseph Atkinson purchased the property and held it until 1788. During this time he converted the plantation from raising and selling livestock into a highly successful Sea Island cotton farm. The Scott’s Ferry played an important role in the Revolutionary War. The colonial forces had planned to place a garrison on high land near the ferry landing to protect this very important means of getting to and from Charles Town. The British April 1780 victory at Biggin Bridge (Moncks Corner) effectively gave the British control of all of the lands between the Cooper and Wando Rivers before the American forces could build the desired fortifications. 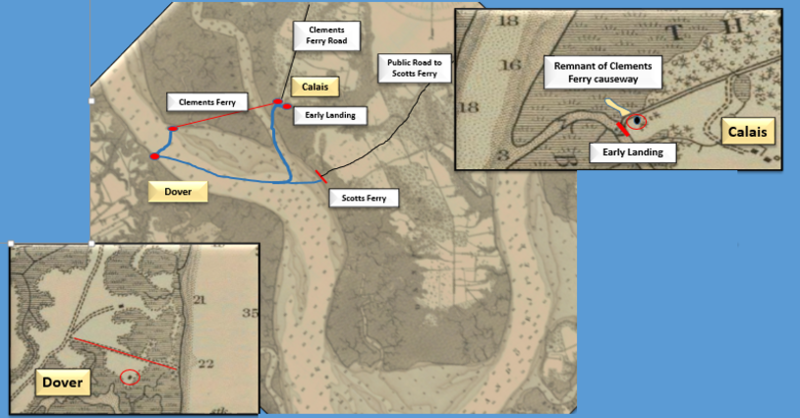 The British understood the strategic importance of the Scott’s Ferry public road, and after the surrender of Charles Town in May 1780, placed a garrison on Daniel Island to protect the ferry landing and Scott’s Ferry road. They also stationed an armed galley (ship) at Daniel Island to patrol the Wando and the Cooper Rivers to prevent any colonial attack on the Public Road. A record of British Colonel Thompson’s command of a regiment in 1782 provides insight into the critical need for the Scott’s Ferry. Several examples detail his 1782 use of the ferry and the bridge that Robert Daniell built across the Beresford Creek to move his “… detachment of 500 infantry, 200 horse and two pieces of artillery” to reach the land between the Cooper and Wando Rivers. Colonel Thomson’s missions focused both on foraging for food as far north as Moncks Corner and the conduct of rapid raids upon General Francis Marion’s forces which were operating to the north of what are today called Huger and Moncks Corner. Clements Ferry is located at the southernmost point of Thomas Island. Several years ago a landowner on Thomas Island found the structural piers for the Calais Tavern. The tavern measured twenty feet by twenty feet and there was strong evidence that it had been rebuilt in its past. The tavern is directly adjacent to a shell covered landing and within ten feet of the Beresford Creek. Glass bottles recovered from a privy located across the landing from the tavern indicates the landing at Thomas Island was being used as early as 1700. Extensive artifact hunting has taken place over the past decades and the farming of Thomas Island has most certainly destroyed any ability to learn more from formal archeological work. John Scott (II) had acquired significant land along the east side of Thomas Island. Following the end of the Revolutionary War John Scott (II) was banished from South Carolina and all of his property confiscated by the State due to his ardent support of the British Cause. In 1785 John Clements purchased a majority of these lands from the State and immediately began work on the establishment of his ferry. Scott, like the majority of those similarly punished, was later found guilty of lesser crimes that did not warrant banishment from the State. Their lands were returned to them. In those instances where the land had already been sold, monies paid to the State were provided to the original owner as compensation. Clements was given permission to build a causeway that extended from the southern part of Thomas Island to Ityone Point. From the Point the ferry ran to the long established landing located on the east side of the Charleston neck. This avoided travel down the Beresford and Clouter Creeks before heading north on the Cooper River. As was common practice, Clement also built taverns at each of the landings. This allowed passengers a comfortable place to await the ferry and the proper tides needed to make the crossing. The one on the Charleston side was called Dover Tavern, and the one on Thomas Island was Calais Tavern. There is some question as to the origin of the name Dover, with some sources pointing to a gentleman named Dover, who lived close to the landing. Irrespective, the Dover-Calais connotation mirrored the English Channel ferry, where many Frenchmen lived on the Calais side, and the English on the Dover side. The ferry was often called the Dover – Calais Ferry and the names show on maps that were published as late as 1862. On plats from the mid-1700s the “Road to Clements Ferry” is clearly shown. Clements erected mile posts (miles to go) on the roads leading to his ferry. Several remain and they are all on the Register of Historic Places. The Clements Ferry Road ran from Calais Tavern to Huger’s Bridge. (Today, just south of Huger or at the intersection of Highways 41 and 441) That road today traces the road that was laid out by the Acts of 1707 and 1709 with only minor differences. It retained that name until the mid-twentieth century and the road realignments following the establishment of H.F. Guggenheim’s Cain Hoy Plantation. The War of 1812 created significant economic hardship across South Carolina. It became increasingly difficult to ship goods from America to any other port of call. As a result, fewer and fewer goods headed toward Charleston, greatly reducing the income of ferry owners. Additionally, the frequent hurricanes damaged landings along the Wando, Cooper and Ashley rivers. Ferries with large causeways, such as Clements, would have been costly to repair. The seven hurricanes that swept across the Charleston area between 1804 and 1815 took their toll. Hence, it is no surprise that Clement lost his ferry in 1817. It was obtained by John Gordon and John Springs, who owned several other ferries in the State. Andrew Hibben Senior was authorized in 1770 to run a ferry from Charles Town to Hobcaw and from Charles Town to Scott’s landing on Daniel Island. This competition undoubtedly hurt John Scott’s business, as he was still vested to work between Daniel Island and the landing on the Neck of Charleston. Combined with other financial issues, Scott lost control of the land in 1772. Joseph Atkinson purchased the 246 acre Scott plantation in 1777. In 1842, Dr. John Irving rode a steam powered ferry up the Cooper River and captured his observations and deep knowledge of history in his book A Day on the Cooper River. His book provides great insight into history of ownership of the plantations along the Cooper River. It also provides a glimpse of the Dover-Calais Ferry. In describing a day trip from Charleston to the end of the navigable waters of the West branch of the Cooper one can quickly see why the mule driven ferries ceased operations. He notes that the steamer could leave from Charleston at 5 o’clock in the morning and travel up to and along the west branch of the Cooper River to Fair Lawn plantation. Several stops were made along the way for those that needed to conduct business ashore. After a few hours at Fair Lawn, the steamer heads south to Charleston, arriving by nightfall. He also noted the tumbled down condition of the Dover Tavern and its associated landing. He also points out the “one story building” that still stood at Calais. There remains confusion within many histories and sources as to when the Scott’s and Clements Ferries ceased operations as a ferry and were used as landing places only. Scott’s Ferry apparently ceased operations by the 1790’s although it remained a very valuable landing until after the War Between the States. The Dover-Calais Ferry remained in use until the steamboat began running the Cooper. The locations of the Scott’s and Clements Ferries are purposeful. There are many other sites on Daniel Island that could have easily supported the development of a landing and associated taverns. None of them offered the short travel to the Charleston lands to the west that these locations did.